I travelled to Sapa on a misty morning in a late autumn day in early October after an 8-hour overnight train ride and a half of hour driving up the mountainside. I travelled to Sapa on a misty morning in a late autumn day in early October after an 8-hour overnight train ride and a half of hour driving up the mountainside. Cold air of the beginning of winter days gives Sapa a romantic, loving and gentle beauty. Sapa through my feeling is a lovely girl, always smiling shyly behind her deep blue dress of dense forest and majestic mountain ranges stretching to the horizon. Due to the limited amount of time, I chose the typical tourist sites and the most famous in the foggy town for my schedule. The first things to tell is the conquering trip to Fansipan with cable car. From the church in the centre of Sapa town, you can easily catch a shuttle bus to the cable car station. 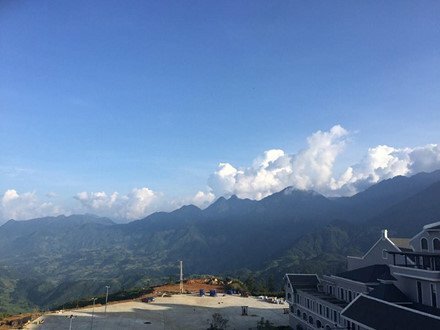 Perhaps long ago when mentioning Fansipan - Vietnam's highest mountain and also the highest peak in Indochina, people would sigh because to be able to conquer the "Roof of Indochina" from the beginning of 2016 and earlier, the only way is to hike along the steep mountain to the peak. This journey should be at least 2 days and 1 night to reach the top. It not only requires participants to have good health, it's also tough to be able to overcome the slippery rocks. The climbers also have to withstand the frostbitten cold when camping halfway up the mountain for overnight stay. So the conquest of this 3.143m peaks was just for the young people or backpackers. 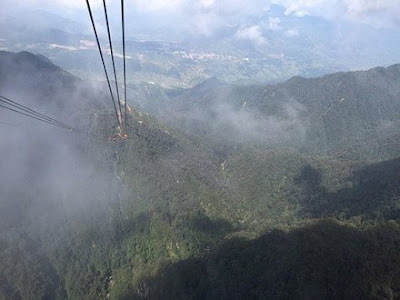 However, when the Fansipan cable car system officially put into operation since the early months of 2016, it has brought opportunities for everyone to get to the peak. Irrespective young or old, you can make your dream come true. The ticket price is about 16 USD for a child and 25 USD for an adult. And nothing better than to be able to put your hands on the 3.143m milestone, whether young people or the elder of previous generation - all feel so proud of our majestic beautiful country. The second point of my visit to Sapa is Cat Cat - a beautiful little village at the foot of Hoang Lien Son mountain range. Cat Cat Village attracts tourists not only by the unspoiled natural and romantic scenery but also by the traditional distinctive culture and unique community of ethnic Hmong here. There are nearly 80 households living in Cat Cat Village, situated along a small stone path deep into the village. The village centre is the gathering place of three small gentle springs: Fairy, Gold and Silver spring, along with the Cat Cat waterfall with white foam water, also known as Tien Sa Falls (Fairy Falls). Besides the waterfall, there are two suspension bridges which are Si Bridge and A Lu Bridge, adorned by the forest flower blooming all year round with lovely fragrance, attracting many tourists to take photos and enjoy the scene. I like the feeling of walking along the stone steps, going into the small village with lots of springs, mountains, forests and then stopping to relax at a wooden bench nearby the falls. I could breathe the distinctive air of the forest, the pure atmosphere and immerse myself in the nature. Sapa has nourished my soul in a gentle way like that. In addition to the interesting places to visit, Sapa also wins the hearts of travellers with superb mountain specialties. Grilled chicken with honey, pork with lemon grass, seven colours sticky rice or salmon soup is delicious foods that you absolutely should not miss when coming here. 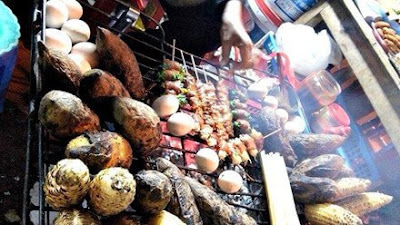 If you like barbeque, there is nothing more wonderful when sitting with a friend in a roadside stall in thick jacket in the evening, select the hot fresh meat skewers yourself. Grilled corn, baked eggs, grilled vegetables ... this is a culinary paradise! If you want to buy souvenirs as a gift, you can take a few hours walking along Church Street. The ethnic Dzao and H’mong children in their featured colourful clothes have lots of brocade souvenirs in their hand for you to comfortably select. Necklaces, scarves, bags ... are skilfully embroidered by hands of the ethnic people living here. Every stitch does not simply create an item but also contains joy and the talent of every person.